Inkling Knowledge is a dynamic and interactive knowledge authoring and sharing platform that empowers your frontline to perform consistently. This puts data within the reach of your workforce when they need it to ensure the continuity of the workflow. When you and your knowledge base team create content with Inkling Knowledge, you can experience a streamlined process that allows you to manage your assets on a single platform. You can also rest assured that the application secures access to data by permissions that you and your administrators have control over. However, publishing articles is not enough. For you to be able to make certain that your content is affecting business results positively, Inkling Knowledge provides you with analytics you can easily view in the software’s dashboard. As such, you can find areas for improvement to further your company’s growth. For large companies, highly functional teams with smooth workflows are at the heart of their success. That is why it is increasingly important for units to have immediate access to helpful knowledge for issue troubleshooting. 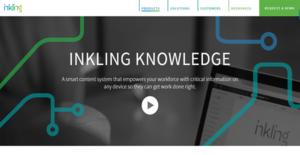 Inkling Knowledge gives you the tools you need to push such information to your employees, partners, and even customers. This reduces your expenses when it comes to training and cuts down time in problem resolution. Inkling Knowledge is optimized for mobile devices. Because of this, your workforce can easily view the information they require when they are on the field. Internet connection is also not necessary as they are empowered to work offline by the application’s disconnected mode. Inkling Knowledge is more than a knowledgebase for troubleshooting technical issues. It also serves as an interactive training platform for your employees with its interactive content that includes engaging media. This helps increase information intake to get your team up-to-date about enterprise rules and proficient in their tasks. Memos regarding changes in the company’s standard operating procedure is an expeditious way to inform everyone. However, employees can forget these updates especially when they are not currently relevant to their roles. Inkling Knowledge provides you with a platform where you can store data about SOPs for your personnel to access and review when they need to. Inkling Knowledge comes with pre-made quiz widgets you can attach to training courses and pages of knowledge. These help you ascertain whether employees truly understand the information they encounter and how these apply to their daily conduct. Furthermore, you can also see how your workforce consumes training and knowledge materials. You can utilize these data-based insights to enhance your content and improve learning experiences. If you are considering Inkling Knowledge it could also be beneficial to check out other subcategories of Best Knowledge Management Software listed in our base of SaaS software reviews. It's important to realize that almost no software in the Knowledge Management Software category will be a perfect solution that can match all the requirements of various business types, sizes and industries. It may be a good idea to read a few Inkling Knowledge reviews first as specific solutions may excel just in a very small set of applications or be created with a very specific type of industry in mind. Others might function with a goal of being simple and intuitive and therefore lack complicated functions needed by more experienced users. You can also find services that cater to a wide group of users and provide a powerful feature base, however this in most cases comes at a higher price of such a software. Be certain that you're aware of your needs so that you pick a software that has all the functionalities you look for. How Much Does Inkling Knowledge Cost? Inkling Knowledge is a platform for empowering your frontline workforce to deploy actions that are in accordance with situations and company rules and procedures. If you are interested in training and keeping your employees updated with regulations with this solution, you can request tailored enterprise pricing from the sales team by phone, email, or web form. We realize that when you make a decision to buy Knowledge Management Software it’s important not only to see how experts evaluate it in their reviews, but also to find out if the real people and companies that buy it are actually satisfied with the product. That’s why we’ve created our behavior-based Customer Satisfaction Algorithm™ that gathers customer reviews, comments and Inkling Knowledge reviews across a wide range of social media sites. The data is then presented in an easy to digest form showing how many people had positive and negative experience with Inkling Knowledge. With that information at hand you should be equipped to make an informed buying decision that you won’t regret. What are Inkling Knowledge pricing details? What integrations are available for Inkling Knowledge? If you need more information about Inkling Knowledge or you simply have a question let us know what you need and we’ll forward your request directly to the vendor.